Early installation of Bird Gard bird control devices is recommended to farmers dealing with Scaly Breasted Lorikeets. The Scaly Breasted Lorikeet has a plain but beautiful arrangement of colours and is found along the eastern coast and the eastern half of the southern coast of Australia. 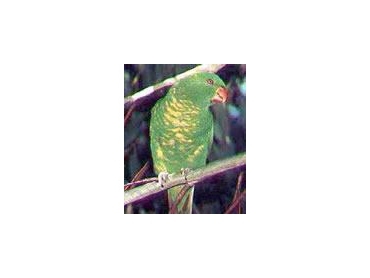 They mainly feed on tree blossoms and some insects and have readily adapted to fruit crops. Much to the annoyance of Orchardists, when the local food supply runs out, they may disappear overnight, having moved on to search for a more productive area. Orchardists often find that they have few lorikeets one day and thousands the next. Therefore constant management is needed to deal with any rogues birds. It is not unusual to see lorikeets sitting high in the treetops wanting to fly down into the orchard, but being kept at bay by the sounds of Bird Gard bird control systems.